It is a common lament of mine that seminaries in Canada pay little or no attention to the arts. Oh there are some exceptions but by and large art make no appearance in these hallowed halls and classrooms of theological study. So I must note that the two Anglican colleges at Toronto School of Theology, Wycliffe and Trinity partnered in hosting Chinese Christian Artist He Qi. He Qi is a quiet man with a broad smile and that gentle Chinese demeanor. He is a professor at Nanjing Union Seminary in China and serves as an adjunct professor in the philosophy department of the University. His doctoral dissertation compared the presence of Buddhist art and Christian art in Chinese society. He was one of the first scholars to take up the subject of religion and art after the Cultural Revolution in China. 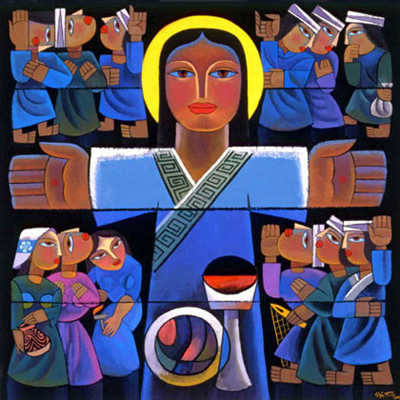 This artist is deeply committed to the promotion of Christian art in China. For He Qi it is very important that Christian art and the Christian story be a presence in the Chinese culture. In a conversation with the artist I noted that all the work that was on display for the Toronto visit and all the work on his website had Christian subject matter and I asked if he did other sorts of work, landscapes or abstract work. His answer was telling, he paused and said “Life is too short, I must do Christian art”. In his lecture in Toronto he noted how traditional Chinese art is without color, it is black and white. Clearly influence by a Christian doctrine of creation He Qi has a very colourful palette. One could say that among other things his paintings are a celebration of colour. The style of his work is iconic, and seems to fit with what we call folk art. The images are strong but gentle. One can discern the influence of those who have gone before in art history and at the same time see qualities that draw on indigenous Chinese culture. He Qi is very clear about his desire to give his work a Chinese identity. He resists any facile adoption of styles from the past and is a keen advocate of being contemporary. But as an art historian he knows that one cannot and should not ignore the past. It is interesting to know that in far off Nanjing there is an artist teaching in a Christian Seminary. I learned that students go to seminary right after “middle school”. The first four years provide the foundation for their next three years of theological training. There seems to be a certain wisdom in including art history as a foundation for the study of Christian theology. Art after all is a rich reservoir of cultural and religious history not to say a resource for theological and biblical awareness. 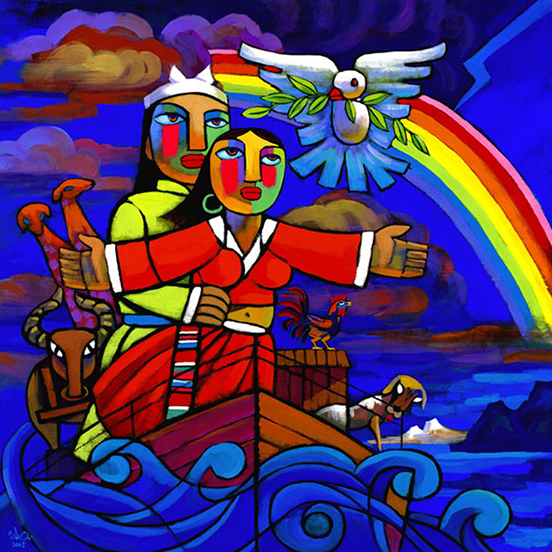 He Qi’s commitment to doing only Christian subject matter is a practice that would find resistance among Christians in some artistic quarters in North America. Cultural differences clearly bear on this matter and it is a subject worth discussing for those in the Christian arts community in the west. Whatever the case He Qi is a man with a deep sense of Christian calling and a very special artistic gift.